I have to admit, once I thought of writing about this topic, I started kicking myself because it seemed like such a no-brainer. I have several coffee cups in my kitchen cupboards that are emblazoned with sublimated logos from places I’ve worked. I have lanyards from past trade shows which are printed either with the name of the show or the name of a corporate sponsor. I have a tile which we made for a table for our trade show booth which has the logo of our thread manufacturer on it. I’m sure, if I looked hard enough, I could find a variety of other items that feature sublimated corporate logos in use in my home. We all have them. Everyone probably has something with a corporate brand on it, but it is easy to forget that someone had to make those items. When you’re looking for markets in which to sell your sublimated goods, corporations can be very fertile ground, if you remember to let them know that you can create the items they need. Sublimated corporate goods can also be a great add-on if you do embroidery. While you’re embroidering that left chest logo, you can be putting the same logo on mugs or mousepads as well. This allows you to offer a more complete service to your customer while also increasing the size of their order. The Advertising Specialty Institute, which is one of the organizations that focuses on the sale of promotional products, has a great series of articles on selling to various corporate markets. While each individual market will have its own unique quirks and characteristics, there are some basic things to remember when selling corporate branding products to your clients. 1. Know the company and the market – A sublimated bowl for candy probably won’t be a hit at the dentist’s office. A shop that repairs vintage typewriters probably won’t be a good fit for a mousepad with a corporate logo. 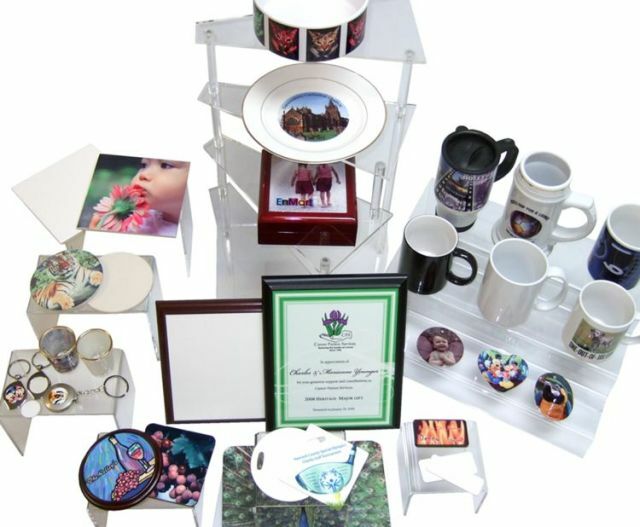 Make sure you know your customer’s business and that you offer them a sublimated product that meshes with their brand. It’s easy to assume that everyone can use a mug or a mousepad, but the way to make the sale is to find a product that meshes with the customer’s current branding and perhaps expands it in a new and unique way. 2. Sometimes a sample says more – There are times when a picture, or a sample, really does say more than 1,000 words. Allowing customers to create samples is part of the reason why EnMart does not require case quantity purchases of our sublimation blanks. We know that sometimes the best way to get the order is to do a test item first, so your customer can handle it and see how their customers react to it. 3. Think outside the norm – How many uses can the average person find for a mug with a corporate logo on it? You can drink liquids out of it. You can use it to store pens and pencils. I suppose you could grow a small plant in one, or put candy in a mug, but really the list of things that can be done with a corporate mug is pretty small. Multiply that corporate mug by three or four or ten and you probably have reached the average number of corporate mugs most people have. If you want to offer your customers a sublimated corporate product that will make an impact with their customers, you need to go beyond the standard. I’ve talked about thinking beyond the sublimated box before, and the advice I gave in that post, and in this one, still stand. How an item is labeled doesn’t have to dictate how an item is used.